Description: Big town centre weir flanked on all sides by poshness. I’ve been there loads of times and I can never honestly say it was good. 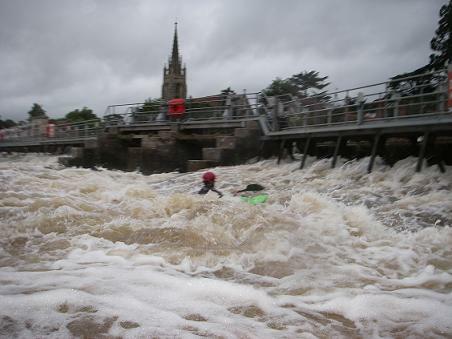 In low water you can do tailies and muck around with the water pouring over the weir steps. In high water, at certain unguessable levels other than extreme flood, when even mapledurham is washed out, some front surfing waves appear. Hazards: Be very careful of the main gates as there is a massive tow back of about 15 meters so avoid at all costs. This weir is not for beginners and is very shallow so damage to you and kit is very likely. Paddle at your own risk. Directions: Follow the signs for Marlow from the A404, follow the road into town. To find the high street turn left at a roundabout near the town centre then left again which takes you onto the high street and on towards the bridge. Park near the bridge and find a footpath near the bridge to the water. The Weir is 100 metres downstream. Alternatively take the Bisham exit from the A404 and follow the road straight to the bridge.